a cheap orange we tear with our nails. And we look to feed, and we feed to love. And when she eats she eats us alive. one or two steps on the ungiving ground. 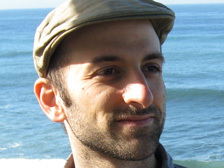 Dan Rosenberg’s first book, The Crushing Organ, won the 2011 American Poetry Journal Book Prize and was published in 2012. His poems have appeared recently or are forthcoming in several magazines, including jubilat, Conjunctions, and Thermos. He co-edits Transom and is pursuing his PhD at the University of Georgia.